Over the holidays Sean and I had our first experience with foster pups. I kept it pretty quiet since I was trying to avoid everyone making comments like “this is how you end up with five dogs!” or “don’t you have enough animals already?” We were helping out some people here who found a litter of puppies shortly before leaving for vacation. Since I’d be home and we didn’t have any plans I figured having two extra little ones in the house for a few weeks wouldn’t be a big deal. I’ve always told Sean if we were ever in a position to foster I would be happy to provide a dog a loving environment until they find their forever family. We toyed with the idea last year in Maryland, but we didn’t have space in our little house and I was worried how Ren would react to another dog since he was going through so many behavioral problems. Plus we ended up moving to Georgia earlier than originally expected. It just wasn’t a good time for us to add to the chaos. 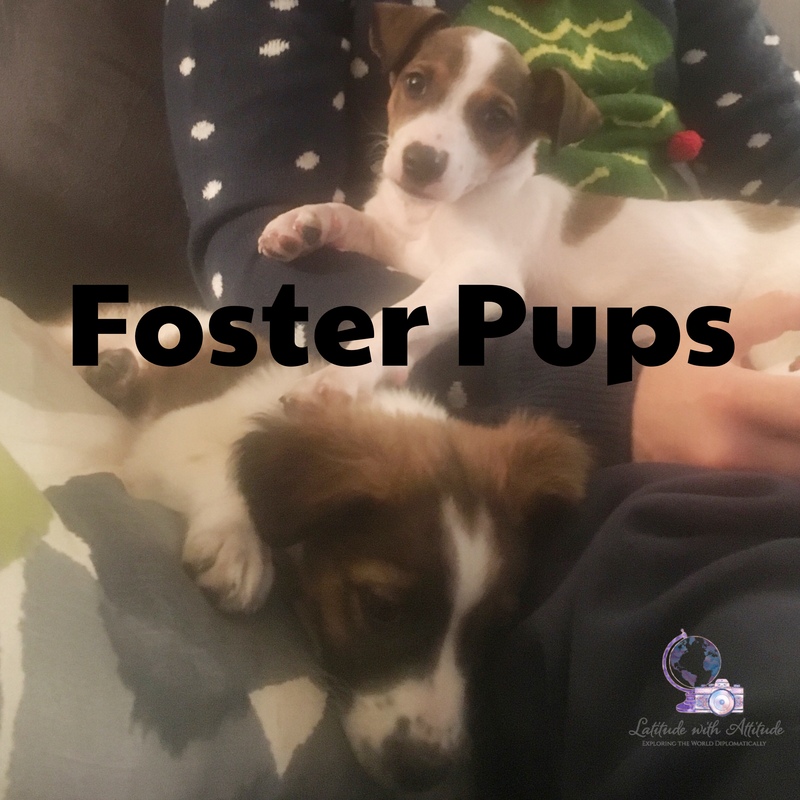 Here in Georgia, there is a shelter organization that runs a foster program. I’ve been extremely wary of getting involved for a bunch of reasons. The main one being I don’t want to get attached to another animal and end up with more furry creatures to move around the world with us. We’ve only been in Tbilisi for six months and I’m already dreading our PCS out of here, especially after the nightmarish experience with a pet shipper. I also definitely don’t want another puppy in the house. I love having three adult dogs I can trust. They don’t chew up my slippers. They (usually) don’t pee on the floor. And, if it’s quiet for a few minutes I don’t wonder what they are up to. It’s really nice to have turned that corner with them. I knew we would have these two puppies for a finite amount of time. And I knew they weren’t my responsibility when it came to finding homes. But that didn’t prevent them from working their way into my heart. There’s something about a puppy trying to find it’s way in the world that’s hard to resist. It was also fun to experience littermates for the first time and watch them come out of their shells after a few days. The little girl was definitely bolder and much more high energy than her snugly, laid-back brother. She was constantly getting into trouble. But when she finally calmed down for a nap my annoyance would fade, and I would have to actively remind myself not to get attached. The day they left was a hard one. I was already upset from a lot of other things. The dreary weather, the post-holiday funk, feeling gross from indulging in too many Christmas cookies, you know, the usual January blues. 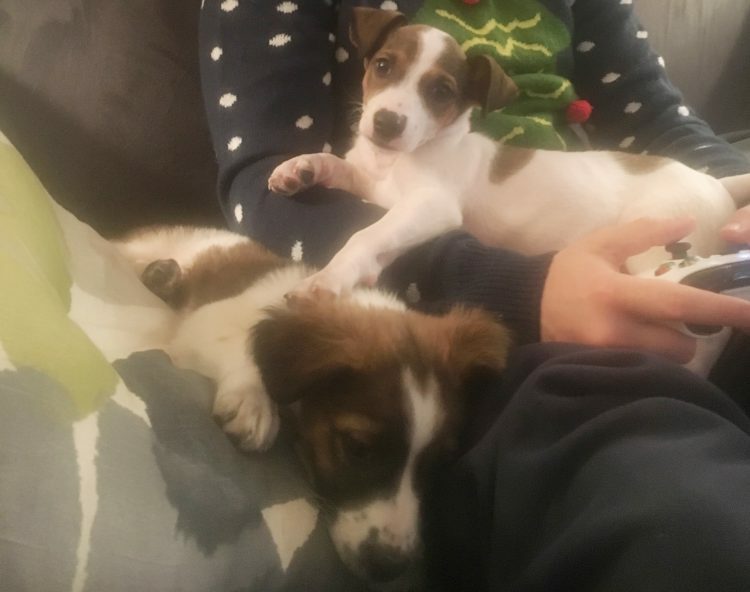 Having that also be the day the puppies left drove to the point of doing something I never do, calling Sean and work sobbing uncontrollably. I think what broke me is knowing I don’t have control over what happens next to these sweet puppies. It was too much for me to bear. I don’t want this experience to turn me away from fostering dogs in the future, I just think this is not the right environment for me. Yes, many Georgians love dogs, and yes the shelter is going to care for them if they end up there, but it’s still hard for me to picture those puppies anywhere but with a family. Perhaps in the future, I can work with a rescue group that can promise me loving homes for every dog that passes through my house. That can promise me they would never surrender an animal to a shelter. That they would always, always be safe. For now, all I can do is tell myself that no matter what the future holds for these two sweet puppies, at least they knew love for the short time we had them. I hope they can remember that. You did such a great thing taking care of them. I know they will carry your kindness forward in their hearts. I love you guys for everything you do.